Pepin of Herstal died in 714 after uniting the Frankish state. His son Grimoald II died during Pepin’s lifetime. 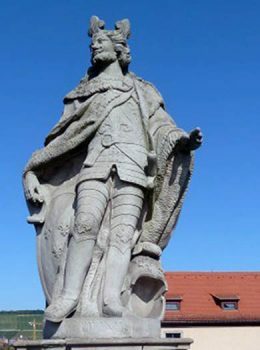 Nevertheless, Pepin had another illegitimate son Charles, also known as Martel, which means hammer. Charles Martel would become a worthy heir to Pepin. He strengthened his position as majordomo, raising Theuderic III on the throne, a Merovingian descendant. Theuderic III was only formally king; the real power behind the throne was Charles Martel. Since the military organization of the Merovingian state was not able to repel its enemies, Charles Martel organized reforms. His goal was to form a strong body of cavalry. To allow the horsemen to train and to obtain the expensive gear that was needed to be granted land and serfs. Martel confiscated a great amount of church fiefs for these military needs. Martel was successful; he created a strong army that he led into many victories. Martel had gained little from the wars with the Saxons. He conquered the Bavarians but also left their own duke in charge. He also defeated the Frisians and Alemanni. He was not so merciful towards the later and confiscated their duke titles. Martel showed his ambition to conquer Aquitaine in 731. Aquitaine belonged to the Franks until 501 and the battle of Vouillé. Aquitaine gained independence in the period of weak kings and strong majordomos. Martel invaded in 731 but was unsuccessful. In 732 duke Odo pleaded for Frankish support against the Arabs from northern Africa. These Arabs invaded the shores of southern Spain early in the 8th century. They defeated the Visigoths in 711 in the battle of Guadalete, and destroyed the Visigoth kingdom. In 717 the Arabs conquered Septimania and threatened Aquitaine. 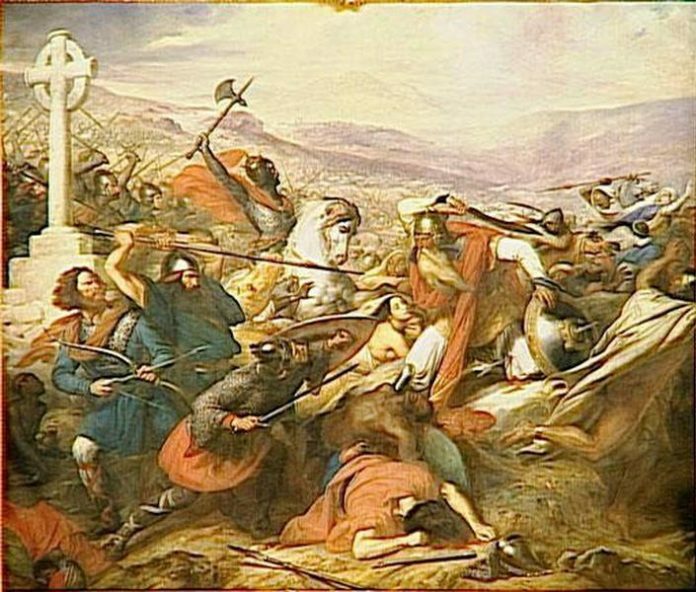 The decisive battle between the Arabs and Charles Martel, who was supporting Aquitaine, was fought near Poitiers in 732. Martel defeated the Arabs and stopped their advance into Europe. After the battle Aquitaine had no other choice than to submit to Frankish rule. In the meantime the Dukes of Provance, who harbored separatist sentiments, called the Arabs for support against Charles Martel. Realizing that Martel was busy elsewhere (he was campaigning against the Saxons) the Arabs advanced up the Rhone river. Seeing how his army was too small to confront the Arabs, Martel called the Langobard king Liutprand (712 – 744) for support. Liutprand successfully stopped the Arab advance and Provance was conquered in 739. King Theuderic III died in 737 Martel didn’t support any other candidate but proceeded to rule by himself; although he only retained the title of majordomo. He divided the state between his sons Carloman and Pepin in 741 shortly before his death. Charles Martel died in 741. He divided the state to sons shortly before his death. Carloman was granted reign over Austrasia; Pepin was granted Neustria, Burgundy and Provance. The brothers were faced with much instability in the first years of their reign. Under the preface that there is no legitimate king Aquitaine seceded, the Alemanni and the Bavarians rebelled while the Saxons were attacking the borders of the state. To give legitimacy to their reign the brothers found a boy of Merovingian descent whom they raised on the throne as Childeric III. They proceeded with the pacification of Aquitaine, the quelling of the Bavarian and Alemanni rebellions and repelled the Saxon attacks. The brothers ruled together until 747 when Carloman retired to Italy, embracing monastic life. With this act Pepin the short remained as the only true leader of the Franks. Nevertheless, the consolidation of his power was not met without resistance. He was opposed by his brother Grifo and Carloman’s son Drogo. All these circumstances were leading towards the need to legitimize Pepin’s reign. In 750 Pepin the short wrote a letter to Pope Zachary (741 – 752) with the question of who should rule; the person which wields no power or the individual who has the real power in his hands. The Pope’s stance was that the kingship should fall to the person who wields the real power. Although it is clear that the Pope enabling Pepin’s ambitions; the real question is why? In this period the Langobards were growing stronger in Italy and they were a threat to the Papal estates. The Pope was hoping for Byzantine support, but since none was given the Pope had to look for a new defender; Pepin the short took on this role. The Pope was ready to support Pepin in his ambitions for the Frankish throne while he counted on his support against the Langobards. Encouraged by Papal support Pepin dethroned Childeric III and sent him into a monastery. In 751 he called a council of the aristocracy. The council proclaimed him king of the Franks, and Boniface, the archbishop of Meinz, crowned him. What was happening in Italy in the meantime? In 751 the Langobard king Aistulf conquered the Ravenna Exarchate, but his ambition was to conquer Rome in the same fashion as his predecessors. Already in 753 the Langobard pressure was so intense that Pope Stephen II (752 – 757) left Rome. Now was the time for Pepin the short to step in on behalf of the Pope. Accompanied by Frankish envoys the Pope left the “eternal city” through the Langobards. He spent a year at Pepin’s court. There he crowned Pepin once again and his sons were anointed. In 754 the Pope and the Frank king met in Quierzy, which is near Paris. Pepin promised, in the so called treaty of Quierzy, that he will support the Pope in the conflict with the Langobards and that he will restore the church titles and fiefs. In 755 the Frankish army advanced into northern Italy and swiftly surrounded Aistulf king of Langobards, who was holding out in Pavia. The Franks retreated since Pepin promised that the Ravenna region would be granted to the Pope. But the Langobard kings were not honoring the agreement which led to another Frankish invasion in 756. This time Aistulf was forced to cede Rome and Ravenna to the Pope and to acknowledge Frankish rule. This way the Pope became a worldly ruler; the ideological background for this was found in the Donation of Constantine. In 752 Pepin annexed Septimania. He led a campaign against the Saxons from 753 to 755 where he forced them to pay tribute. In 763 Bavaria became independent. In 768 he pacified Aquitaine – confiscating the Duchy title and dividing it into counties. The many wars which Pepin led didn’t allow him to restore the Church fiefs which were confiscated by his father. Although he ordered that everyone has to pay the Church a tithe.